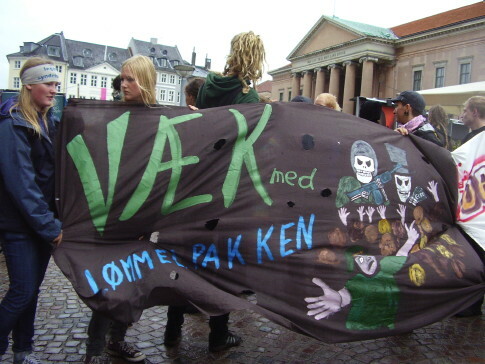 Social Forum Journey » Danish law 1243: Truth! 2010: Power? Danish law 1243: Truth! 2010: Power? 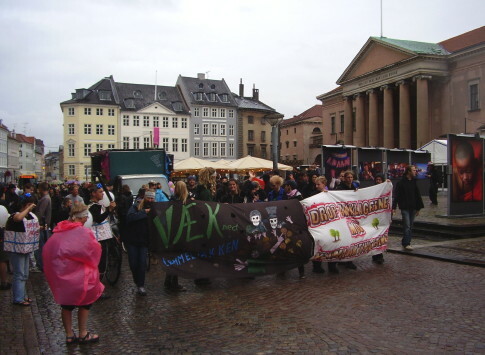 A demonstration was held in Copenhagen on August 18 in support of the spokes persons for Climate Justice Action (CJA) accused of serious planning of violence during the Climate summit. On my way to the demonstration I met an old women on the train from Sweden. Here hair was as white as her perfect blouse. Her dress was as red and as bright as her white appearance, both colors in accordance with the Danish flag. 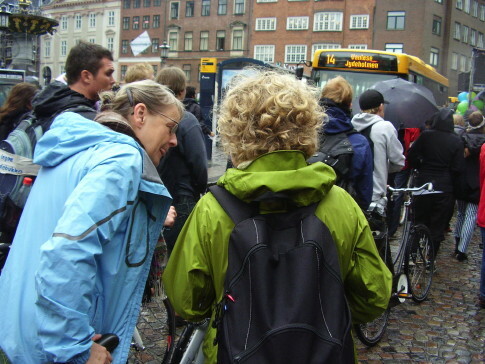 A metal pin on her dress said she was an educated guide so I dared to ask, were is the court house in Copenhagen. I had been invited to speak at the demonstration which was supposed to pass the court were the trials against CJA spokes persons take place. It seemed as a good place to try to catch up with the demonstration. At the same time I needed some inspiration for a speech as well as understanding how people in common feel about justice. The guide was eager to inform me. Soon I did not only know the way to the court but also the essence of Danish juridical tradition. Denmark is not only proud of having the oldest national flag on earth from the 13th century but also one of the oldest laws still in common knowledge among people. She told me about the Code of Jutland from 1243 and the two essential parts of it. The first being ”By law shall the land be built.” The second ” There is no law to follow as good as truth”. It was the second quote that the guide especially put forward as essential for believing in the law as something good, at least I got that impression. Arriving at the court there were only policemen. So I asked if they were waiting for a demonstration and the Code of Jutland. 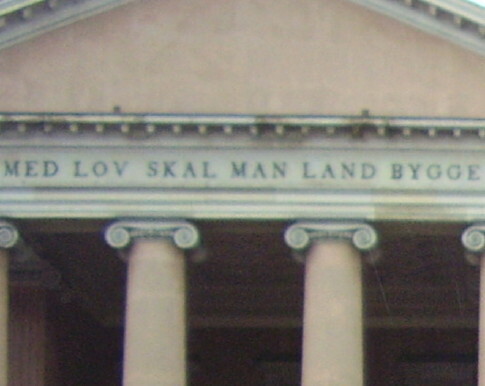 Above the high entrance of the building was written in big relief letters:”By law shall the land be built”. The policemen seemed inspired by talking about the quote but as the guide more emotional about the second quote which was not walled to the building. Truth as an argument is more convincing for people in legitimizing the law than that the law is the foundation of the country. Soon the demonstration arrived. Loud, lively and joyful it was. 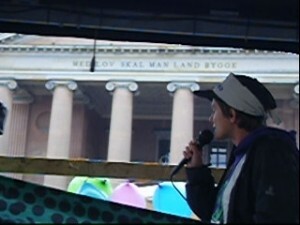 In the front two banners: Drop the accusations against the Climate actvists. Two policemen, each one wrapped up in a parcel swinging their batons over their head were also in the front of the demonstration. 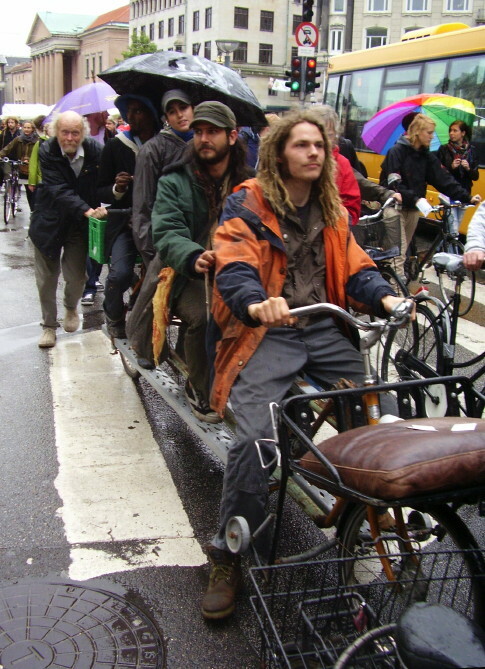 On their parcels it was written ”Lömmelpakken”, the well known new ”hooligan” laws against civil disobedience put in place before the Climate summit to enable the police to make arbitrary arrests and put people in prison on charges that before was only a question of disturbance of peace which could render a fine. 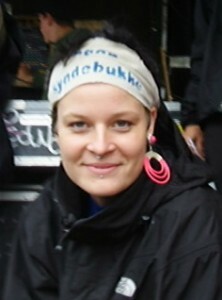 Tannie Nyböe, one of the accused in the trials were moving the demonstration from the loud speaker van interacting with the participants in the best of moods. Many were carrying scarfs in their hair stating I am no scapegoat. Maybe an accusation of the trials to be a political theater organized by those in power. A political theater to create an image that the omnipotent police operation during the summit was justified. This at the same time as a few persons were handpicked to be accused of a crime committed by thousands, that of planning in consensus non-violent civil disobedience. 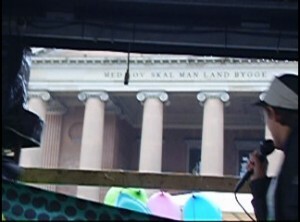 In front of the court Knud Vilby, author and spokesperson for the December 12 initiative organizing the 100 000 demonstration during thee Climate Summit were speaking. He was introduced as someone that has done a lot criticizing the police helping accused CJA-activists a lot backing his arguments by his own experience during the preparatory process. He was then cooperating with those now accused in the preparation for the large demonstration. He strongly criticized the police with almost similar words as in December, now for acting out of proportion. 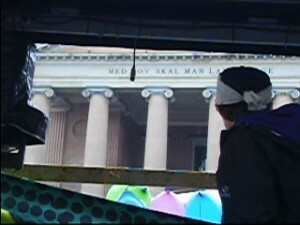 Than the demonstration moved on while the rain poured down more and more on the wet but creative and committed participants mixing music and speeches while walking towards Nörrebro. A member of the Climate Collective told us why the police and juridical system reacted so strong on the protests. They were system critical threatening capitalism. 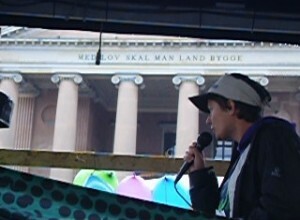 Environmentalist and defenders of peasants, Bente Hessellund speaking with Line mother of the accused Stine and speaker at the demo. Then at the end I entered the demo van to address the situation. Everything was already said it seemed, so what to add? I took the conservative angle. 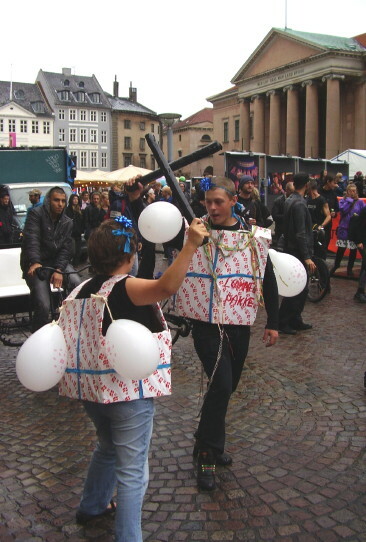 Who is protecting the Danish juridical tradition? If the best law is the result of the truth, saying the truth about the repression during the summit is of importance. The truth is simple. The mass arrests were unacceptable. The 918 arrested in the main demo and the others victims of mass arrest had done nothing. The preventive arrests and the trials against the spokes person of non-violent CJA actions are not only unacceptable, they are an offense against justice and the core of any fair handling of conflicts in society. The spokes persons whether they were arrested in beforehand or during the Reclaim power action outside Bella center are not accused of causing disorder. They are accused of causing violence. To push is not an act of violence. To plan together with others to push or to tell others to push is not an act of violence either. To claim that the word push automatically means that you are violent is not speaking the truth. Everyone is responsible for hers or his acts. This separation of responsibility is the core of any juridical system that we can say is truthful to the principle that everyone is entitled to a fair trial. If someone uses violence after being told to push and use non-violence it is not caused by those that calls for non-violent pushing. The whole basis of the trials against the spokespersons of CJA builds on this betraying of a fair juridical system. That is why they are not acceptable. That is why the only truthful sentence is not guilty. 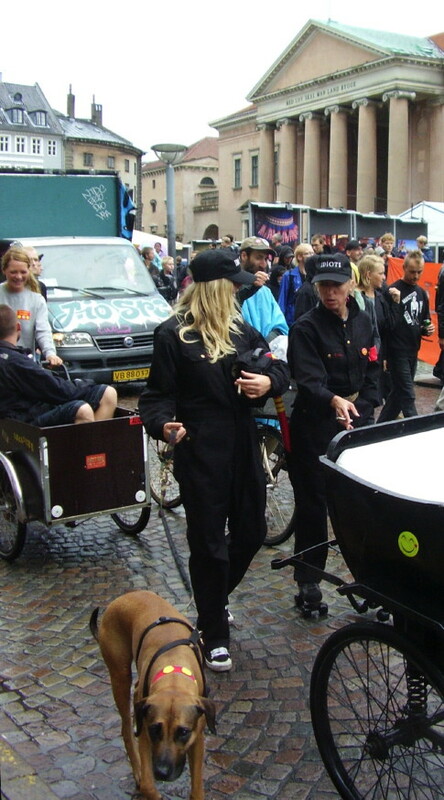 Extra cops with dogs during the demo with IDIOTI labels instead of POLITI, (Idiots instead of Police), a regular security measurement at demonstrations in Copenhagen sent out with the three yellow dots on red Christiania symbol. 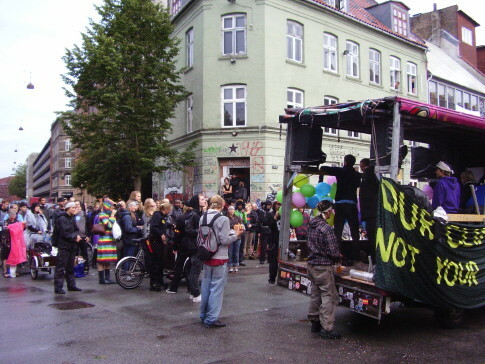 Many seem to say that the majority of the Danish people have the opinion that it is the non-violent Reclaim power protesters that causes violence also when all violence is enacted by the police. This is against the truth and Danish juridical tradition. If the majority of the Danish people are against Danish juridical tradition they have no right to claim that they build upon their pride of their country on the Code of Jutland from 1243. They are then betraying the core of the juridical principle that keeps a society together. They are at the same time betraying a principle that keeps any fair society together as the Code of Jutland is something that can be found in any society built on the respect for the truth. But truth is something that we have to stand up for. Atomized in front of TV-sets we may have less chance to come to a true assessment. Truth, at least when it really matters, is something we have to fight for in common. Danish organizations building on representative democracy acted individually in response to the unacceptable repression during COP15. Furthermore they claimed that the issue of mass arrests during the 12th December demonstration was a question of disproportionate behavior by the police. This means that they claimed that it was a question of something relative, not a question of something absolute. That means that the representative Danish organizations moved the case from the quote that is what a Danish guide and policeman remembers from the Code of Jutland to the second part of the same quoted sentence. The latter part of the sentence reads as follows: ” but where there is doubt about what is truth, the law shows the way to truth” By making the issue a question something relative we move from the realm of truth to the realm of bargaining. To something we can look different upon, and thus we move to make any law, even the most questionable ones, into the decision-makers what is right and what is wrong, and in the end what is truth. I claim that the representative Danish organizations turned away from the truth and instead turned the issue into a competition for individually bargain for a position within the realm of the relative. They acted in a coward way. Knud Vilby have changed his language a bit now stating that the police acted out of proportion and not only disproportionate as he said last winter. 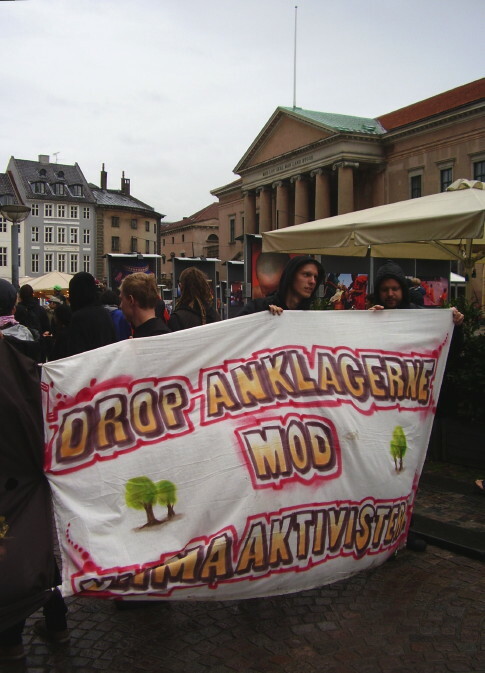 The predecessor of Klimaforum09, the Grass root Network for Sustainable Transition has finally got Danish organizations together and started to react collectively against the repression and the on-going trials. But still we are not at the point were Danish organizations that invited protesters from the whole world jointly stand up for the truth and tells the Danish people and everybody else: The mass arrest during the 12th December march is not only disproportionate, it is unacceptable. The lack of collective response from the Danish organizations inviting people to come and demonstrate unacceptable and paved the way for further unacceptable repression during the Summit. The trials against the spokes persons for non-violent civil disobedience actions build on disrespect for the truth and are unacceptable. Representative organizations is one important tool for making collective action possible. If representative organizations fails us in standing up for the truth and the right to protect the planet we live upon, it is no wonder that individuals in Denmark lacking this tool reacts by forgetting about the Code of Jutland from 1243. Now is the chance to regain respect for the truth by standing up collectively in support of the accused spokespersons from Climate Justice action. One thing is for certain. You will get support from people movements from all over the world that are the carriers of democracy and willing to save our planet. The people movements were already 18th of December standing up for the truth supporting the demonstration called for by CJA against repression during the Summit while the representative Danish organizations were hiding from saying the truth collectively. The Danish organizations are welcomed back to the the collective efforts in democratizing the world by standing up for the truth. But maybe more importantly, you will be respected by anyone that sees the principle ”There is no law to follow as good as truth” as essential for any society. 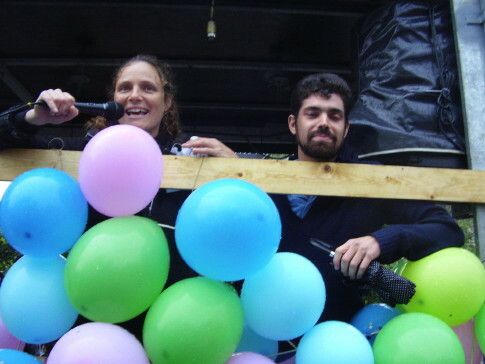 It all ended at Bumsen, a community in Nörrebro with the accused Natascha Verco and Noah Weiss speaking to us, full of good spirit. Klima-aktivister er frustrerede over at blive slæbt i retten i kølvandet på COP15-topmødet. 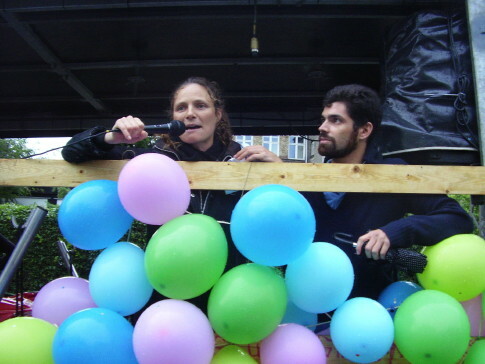 Climate activists are frustrated at being dragged into court in the wake of the COP15 summit. Forfatter og klima-veteran Knud Vilby opfordrer til solidaritet med de anklagede aktivister. 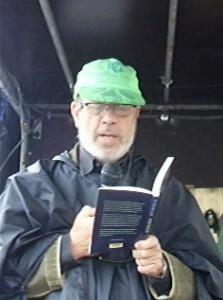 Author and climate veteran Knud Vilby calls for solidarity with the accused activists.